It is time to change homes once again, and I know from experience it will not be easy. What will my home look like? Larger or smaller than the one I have now? Who will I interact with on a weekly basis? Will they accept me for who I am, shortcomings and all? When will this move take place? During a holiday season when every home looks great and the people are welcoming to strangers? Or will I move in during the regular grind of day-to-day living when many are too busy for more than a ‘nice to meet you’ before they hurry away to their own lives ? Where exactly am I moving to? There are so many homes to choose from within the area we have chosen to live. How long will it take for me to feel at home? It is hard because I always seem to measure every home against just one other home. This home nurtured and surrounded me with many wonderful people. These people – my parents and siblings, my parent’s friends and their children, my friends and classmates, my neighbors, my teachers…they shaped who I am today through exacting standards, challenges, high expectations, love, lots of laughter, and forgiveness. I truly loved my first home…St. Columban Catholic Church in Birmingham, Michigan. There is an old saying that you cannot go home again but that does not mean we ever stop looking. I joke about being a ‘Roamin’ Roman Catholic’ because when I move it takes so long to find the right Church… the right home… for my family. 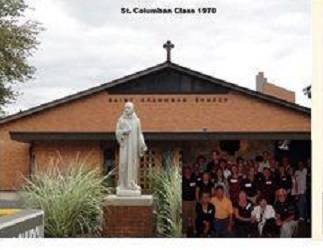 I measure every new Church by my memories of growing up Catholic within the St. Columban community and neighborhood. Although it took a few years, I did find a wonderful family at St. Gabriel in Concord Ohio and it will be hard say goodbye and start looking once again…but I will. I may end up at St. Rita’s in Marion Ma, or a St. Anthony’s in Mattapoisett Ma. Then again, St. Patrick’s in Wareham, MA might offer a phenomenal community for the Irish O’Bannon Family. If not, we can always take a drive to Fairhaven, MA and attend St. Mary’s. Finding the right home is not an easy task! So I’ll take a deep breath, wave goodbye to St. Gabriel’s, say a prayer for guidance, and start roamin’. Great write. Maybe some day I will pop in for a visit. My mom is from Boston and I still have some relatives up there and my brother lives in Rhode Island. Your right you cannot go home again but the memories of our time in MI will never go away. Safe Travels to you and the Family.